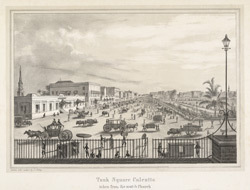 Uncoloured lithograph of Tank Square in Calcutta taken from the Scotch Church by Frederick Fiebig published c.1847. Tank Square, later Dalhousie Square and now BBD Bagh, lies at the centre of the area once covered by the original Fort William. A large tank in the centre of the square was constructed in 1712 in order to provide water storage for the city. The headquarters of the East India Company known as the Writer's Building is located on the north side of the square. The Scotch Church, also known as St. Andrew's, was consecrated in 1818 on the site of the Old Court House. Like St. John's Church, St Andrew's was based on James Gibb's St. Martin-in-the-Fields in London. Fiebig also produced a 360 degree panorama of Calcutta in six parts in 1847 and he took many salt-print photographs of the city and its environs in 1851.